Imagine Jamaica at the end of the 1950s, already gripped by Independence fever as the new nation prepares for the lowering of the flag in 1962. In downtown Kingston the sound systems are booming and competition for the freshest tunes is ferocious. Of course the imported sounds of American rhythm & blues won’t satisfy these souls, so, at about that time, the coming of an indigenous Jamaican music for the masses was inevitable. But this celebratory combination of nationalism and commercialism had another powerful element – Africa. Religion, in the form of Pocomania, and the drum music traditions of Burru and Kumina survived transportation to be embraced in Jamaica where Africanism was clung to fiercely and slave revolts were far more commonplace than on any other Caribbean island. Much later, Rastafari’s sophisticated drum ensembles would provide a living example of these ancient traditions, while the burgeoning music industry was never slow to absorb those influences. Add to this a generation of classically-trained musicians, who had embraced bebop jazz’s sense of adventures, and crowds who just want to dance and it’s little wonder that this tiny island – a population half the size of London’s – has become such a force in global music. Music is not Jamaica’s only gift to the world, but it is how so many Jamaicans chose to define themselves. People will talk about how music and singing lifted the spirits through slavery and colonialism as well as being a weapon against political corruption and civil disorder. It gave the poor people a voice and something to call their own, celebrated the joys of life on the tropical island and spread One Love throughout the world. For fifty years, the natural medium for this music has been the sound system dances, with, traditionally, commercial recordings and release schedules playing second fiddles to these awesome ghetto-centric situations. Thus, for as long as there’s been Jamaican music it’s remained inseparable to the people and the environment responsible for it. Reggae remains one of the world’s last genuine folk musics. Ska is the rollicking, raucous music that perfectly summed up the mood of the people as they approached Independence at the beginning of the 1960s and wanted to announce their Jamaicanness with as much gusto as possible. Even without Independence, ska happening when it did isn’t surprising at all. Kingston’s sound system owners were getting their own version of R&B, Jamaican boogie, specially recorded for them but the local musicians they were using were jazz buffs to a man, thus always looking for means to self expression. It was only a matter of time before things got turned around. Which was literally what Prince Buster and Clement "Coxsone" Dodd did. Looking for new sounds to thrill their dancehall crowds they changed the emphasis of the R&B from the first and third beats in the bar to the second and fourth, creating the offbeat style that became the fulcrum of Jamaican music from then on. The pivotal ska group was The Skatalites, a horn led collection of musicians, many who were classically trained at the Alpha Boys School (a Catholic reform school/orphanage in Kingston that is still renowned today). They approached their task as if they were big band jazz players, with a tight, disciplined rhythm section allowing virtuoso soloists to show off their brilliance. The idea was to whip the dancers up into a frenzy, but keep the beat so that nobody loses their footing. When The Skatalites were in full flow it would be virtually impossible to keep still, as players like Tommy McCook (sax), Roland Alphonso (sax), Dizzy Moore (trumpet) and the great genius of Jamaican music Don Drummond (trombone) took the music into the stratosphere. Likewise when Prince Buster gets going on hits like "Al Capone", "Madness" or "Wash Wash" the excitement level doesn’t drop. As the ultimate good times music (energetic and rebellious), ska was the obvious choice to be married to the British punk scene. It resulted in a ska revival in the late 70s that began in Coventry. It was here that Jerry Dammers set up the Two Tone record label and the band, The Specials. They were decked out in the original 60s rude boy fashions - mohair suits, dark glasses and the ubiquitous pork pie hats. It was this styling and Dammer’s black & white themed logo that were the emblems for a scene that launched Madness, The Beat and … Bad Manners…. Subsequently all around the world, but notably in the USA and Japan, ska lives and it’s still possible to find perfect replicas of the early-1960s Jamaican look. For many, rock steady is the pinnacle of Jamaican music – indeed, so many recent dancehall tunes are built of classic rock steady rhythms from the mid-1960s. The rock steady era followed directly from ska to contrast it in several ways: it slowed the beat down; it was essentially a vocal style; and it was deliberately American as opposed from ska which had worked hard to establish a Jamaican identity. Rock steady was a much cooler, soulful, lovers rock type of music that began life as a means of giving the crowds a bit of a breather and, due to public demand, took over to dominate dancehalls for several years. The backbone of rock steady was the singers as, after years of ska’s accent on musical virtuosity and general volume level, the Jamaican love of singing could come to the fore. Groups like The Heptones, The Melodians, The Uniques, The Techniques, The Paragons and, of course, The Wailers took their lead from the American soul of The Impressions (who regularly toured Jamaica) and The Drifters to produce a uniquely Jamaican approach to harmonising – the lead constantly swapped within the group. While solo stars such as John Holt, Slim Smith, Bob Andy, Ken Boothe and Alton Ellis all came to prominence with this very melodic style. 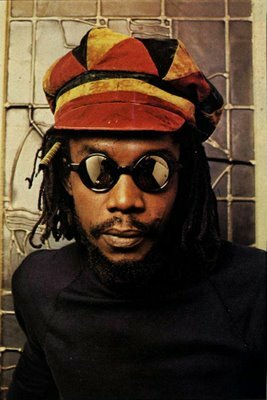 The top producers were Leslie Kong (Desmond Dekker, Jimmy Cliff, The Melodians), Duke Reid (The Paragons, The Tehniques, Phillis Dillon) and Coxsone Dodd (The Heptones, Ken Boothe, Delroy Wilson). They altered the sound of Jamaican music forever by introducing the electric bass and building their backing tracks on that and drums. Today, many of those original rock steady backing tracks remain so strong that they form the basis for a wide range of dancehall hits. The only way to listen to reggae is at a sound system. Ideally, this would be at an open air lawn in downtown Kingston, where it’s 80 degrees at 2am and the bassline vibrates your bottle of Red Stripe, but a church hall in Bristol or a house party in Birmingham will do. The whole point is you’re packed in with like-minded people; you have ownership of the music; the rig is such that you feel it before you hear it; the deejay is vibing up the crowd; and every killer tune brings a noisy reaction. Sound systems took over from orchestras in Jamaican dancehalls in the 1950s – why pay a band when you can play imported US R&B records? The cost of having your own record player or radio was also overcome by the systems putting their speakers in the street for all to hear the music. The first Jamaican record producers - Prince Buster, Coxsone Dodd (Studio One) and Duke Reid - were sound system owners, commissioning recording sessions to ensure a supply of exclusive tunes. Because sound system dances were one of the few things ghetto people could call their own, they became central to downtown life, thus a barmometer of popular taste. Once producers started making records for sale, they’d test new styles out on their sound system and nearly every development in Jamaican music – ska, rock steady, reggae, dancehall and so on has been a result of competition between sound men to find something new to pull in the crowds. Competition for the best equipment and the most exciting music was fierce and sound clashes – contests whereby two sound systems in the same dance played alternate records and were judged by audience reaction - frequently spilled over into violence. Clashes are still part of reggae culture, dub plates get cut with the DJ’s name being overlaid on the track. In London recently the DJ David Rodigan had Wyclef Jean and Tom Jones (!) singing his name live as part of the clash. Wherever Jamaicans have travelled sound systems have been part of their luggage. In Great Britain sound systems established themselves almost as soon as The Windrush docked. They are also at the centre of the Notting Hill Carnival and proved crucial to development of UK urban music as outfits like Soul II Soul in London and The Wild Bunch in Bristol began life as local sound systems. In New York, hip hop grew out of a sound system set up by an ex-pat Jamaican - DJ Kool Herc – as he brought Kingston dancehall culture to American music. Strip reggae – any sort of reggae – back to its essence and you’ll be back to the bass and drum, the groundation of everything that happens in the music. But if you then rebuild on that bass and drum with the imagination, the invention and the sheer mixing board dexterity of King Tubby, Lee Perry or Scientist, you’ll be dubbing. The art of dub is more than merely remixing, although remix culture is an extension of the dubmasters craft, it’s redefining a tune by taking its essential elements and rebalancing them in a way that gives the finished article a whole different meaning but still exists within the same parameters. Witness the Augustus Pablo/King Tubby classic "King Tubby’s Meets Rockers Uptown", an edgy, altogether dangerous three minutes that was once the cool lovers rock of Jacob Miller’s "Baby I love You So". Dub began in Kingston in the late 1960s, when deejays were looking for gaps in records’ vocal performances to toast both their sound system and their selves. "Version" was the name given to these instrumental sides, but, thanks to the 1970s’ rapidly developing studio technology, where was the challenge in simply dropping the vocals in and out? Filters, faders and multi-track recording allowed any component part of the tune to be pushed backwards and forwards in the mix, while the echo chamber and reverb unit brought a whole new dimension to what they’d sound like when they got there. Suddenly, the mixing desk was the most important instrument in the studio and the man who could operate it was the biggest star. King Tubby’s, Scientist, King Jammy’s, Joe Gibbs & Errol T, Lee Perry, Mikey Dread, Gussie Clarke … it was this generation of Jamaican dubmasters that paved the way the way for today’s superstar remixers such as Fatboy Slim, Armand Van Helden and Masters At Work. Dub also had a major influence on the likes of Massive Attack, Mouse On Mars and a whole generation of sonic terrorists. Forty years ago, if you had a sound system you wouldn’t have dreamt of charging people admission to your dance if you didn’t have decent deejay on the mic, vibing up the crowd, bouncing off the records with his whooping and shouting, toasting the sound system itself. This was one more example of Jamaicans "borrowing" something from elsewhere and vastly improving it as they made it their own the sort of wild scatting and jive talking that was "borrowed" from the jocks on black American radio stations powerful enough to reach Jamaica from Miami and New Orleans. But as deejays like Count Machuki, Sir Lord Comic and King Stitt became the main attraction at a dance, it was only a matter of time before they started recording. When a generation of deejays, led by U-Roy, Dennis Alcapone and Scotty began cutting records, they revolutionised Jamaican music. As producers started leaving gaps in the mix or leaving one side blank (the version) deejays then closed the gap between the crowds and the artists. They did this by going straight from the sound system dance to the recording studio where they accurately reflect, in rhyme, the life the saw going on around them – the styles, the dances, the slangs, the politics and so on. Hardly surprisingly, the roots era was heralded by deejays like Big Youth, Jah Stitch, I Roy, Prince Jazzbo, Trinity and Dr Alimantado who gave the new wave a voice with their conscious toasting on the sound systems before any producers would record them. Jamaican deejaying didn’t just provide the template for rap either – an irony in itself as the idea went from the USA to JA 20 years previously – the MC styles of UK garage, drum’n’bass and jungle owe more to reggae than they do to rap. Quite apart from the likes of So Solid Crew, Mis-Teeq and General Levy all growing up around reggae, the big reason is that Jamaica drives British street slang with its words, rhythms and sentence construction, meaning MCs will always lean more towards Kingston than New York. Although Jamaican music has constantly commented on the social and political situation on the island, first and foremost its job is to get people on the dancefloor. It’s therefore hardly surprising it’s made huge impressions in pop charts around the world - Shaggy, Althea & Donna, Prince Buster, Maxi Priest, Chaka Demus & Pliers, Eddy Grant … summer wouldn’t be summer without the regulation big pop-based reggae record. But then well-produced reggae is so basically strong it can withstand virtually any arrangement and still sound like reggae. Indeed reggae’s willingness to take on outside influences goes back to the late-1960s when shrewd Jamaican producers would send vocal and rhythm tracks over to the UK to have lush string arrangements added before releasing them into the British pop market. Orchestrated singles like "Love Of The Common People", "Young Gifted & Black" and "Pied Piper" were huge pop hits, opening up the marker for the bouncy but rawer likes of "Double Barrel", "The Liquidator" and "The Return Of Django". Part of pop reggae does include UK bands such as UB40 who took original tracks and blended their own UK pop culture with Jamaican music. Reggae’s pop sensibilities continued into dancehall too, Smiley Culture and Tippa Irie brought their sound system culture to the pop chart with "Cockney Translation" and "Hello Darling", Shabba Ranks teamed up with Maxi Priest for "Housecall" and Chaka Demus & Pliers are pop chart regulars. But now it’s moved on even further with Shaggy as on of the world’s consistently biggest pop acts, while No Doubt have felt the urge to call on the dancehall deejays Bounty Killer and Lady Saw to add a little Jamaican flavour to their last album. Ten years on from Independence, and Jamaica’s people began to notice they were worse instead of better off. The island was gripped by unemployment, crime and violence, and as so many of the emerging generation of Jamaicans, who had grown up with Independence, were victims of this, they reacted with the most potent weapon at their disposal – music. As the 1970s unfolded, subject matter changed to give voice to the protests the people wanted to express against the government, while urging their fellow youth to stick to the path of righteousness. Large numbers embraced Rastafari as being not only a manifestation of what they wanted from the government – a forcefully honest doctrine of peace, love and anti-corruption – but presenting an alternative way of living within the grinding poverty that had become commonplace. They espoused the teaching of Marcus Garvey (self-help and repatriation) to provide hope. As many musicians locksed up, Rasta’s influence over the sounds became obvious: much of reggae’s inherent sunniness seemed to cloud over: the bass got deeper and more pronounced; the tempo slowed down portentously; and lyrics frequently spat fire and brimstone. It was dread. It was also the period that saw reggae being taken seriously by rock fans around the world as a music that had something to say - punks in Britian adopted roots reggae as a big part of their soundtrack, identifying closely with its sense of alienation. During the roots era, artists like Burning Spear, Culture, The Congoes, Big Youth, The Mighty Diamonds, Dillinger, Tapper Zukie, Lee Perry, The Ethiopians and Max Romeo became cult heroes, while the roots movement’s figurehead Bob Marley became the most famous Jamaican ever. When roots music carried the swing in the 1970s in Britain’s young black communities, the women had a saying – Rastafari was Rasta For Him and not Rasta For Us. In other words there were large number of black kids in the UK who didn’t feel part of roots and culture. They were upwardly mobile, didn’t want to go back to Africa, listened to a lot of soul music, liked dressing up on a Saturday night, were open about being influenced by their environment, but were as proud to be black as any dreadlocked Rastaman. They were a generation that saw themselves as Black British, and they created lovers rock, the first indigenous black British pop style. Although the bassline always let you know it was reggae, its light, airey productions it acknowledged such influences as soul and pop music and its subject matter was almost exclusively devoted to matters of the heart. Hence the name. It found an enormous market that the mainstream music business never knew existed, and labels such as Lovers Rock, Arawak, Santic and Hawkeye put out a phenomenal amount of product in the late-1970s/early-1980s. There were sound systems that played nothing but lovers rock and on more than one occasion it bubbled into the national charts. While the productions were deceptively sophisticated in many case the vocalists weren’t, but they were an accurate representation of the style’s audience – young girls and likely lads. The trio Brown Sugar were still at school, another were called 15,16,17 because of their ages, while the grand old ladies of lover’s rock, Janet Kay and Carroll Thompson, hadn’t yet turned twenty. As far as the guys were concerned it was largely matter of celebration of self – Victor Romero Evans sang about putting on his "Slacks And Sovereigns" and Trevor Hartley of simply "Hanging Around". Lovers rock was also one of the rare instances UK reggae has influenced Jamaica, as artists like Dennis Brown, Gregory Isaacs and Johnny Osbourne spent so long in London they got into it and took it back home with them. Dancehall reggae established itself through characters like Yellowman and General Echo and a penchant for slackness (as bawdy lyricswere known). This deejay-led, largely computerised, upstart music seemed to epitomise the 1980s with dub poet Mutabaruka maintaining, "if 1970s reggae was red, greed and gold, then in the next decade it was gold chains". So far removed was it from the gentle, almost hippification of roots and culture, that purists furiously debated as to whether it was genuinely reggae or not. In spite of the original dancehall reggae irritating the hell out of purists, it was relatively harmless compared to what it was to become. The music deliberately lost all sense of being played on conventional instruments, as computerised sounds were prized for being exactly that – computerised sounds. The rhythms sped up and took on a harshness made seemed designed to keep out the faint hearted, while deejay delivery gained an edge that removed all vestiges of one love. Likewise the subject matter: the slackness, which was really nothing more than the good natured bawdiness that has featured in most Caribbean music since calypso, turned into outright misogyny and a violent attitude towards homosexuals, while an alarming trend for "gun records" reflected the growing gangsterism in Kingston’s ghettos. Shabba Ranks fell from international grace, when he endorsed Buju Banton’s single "Boom Bye Bye", a record which urged the shooting of gays; Bounty Killer toasted gun culture; Capleton’s approach to women was never on nodding terms with political correctness. Amid furious debate as to whether this was reflecting or influencing Jamaican ghetto reality, reggae performed an admirable act of self-regulation, with a roots revival that vociferously rejected what dancehall had become and sought to replace its subject matter with something a little more wholesome. Deejays like Buju Banton and Capleton saw the light, grew dreadlocks and changed their ways to those of righteousness, while still retaining all the excitement of delivery usually associated with dancehall. Beenie Man likewise turned his back on the more nefarious aspects of his repertoire and these new roots deejays were joined by Anthony B and Sizzla, two exponents of Bobo Ashanti, the hardline end of Rasta that sought to reclaim it from the "fashion dreads" of the 1980s. Another development was, in the wake of the late Garnett Silk, a new wave of roots singers who managed to combine Bob Marley’s sensitivity and spirituality with a modern approach to their music. Luciano, Tony Rebel and Morgan Heritage lead the way, while a resurgent Cocoa Tea seemed more than comfortable with the new rhythm patterns.